I choose to do Sentinel Bases due to the fact that they have no mines. Mainly doing level 20 since I can use rubi and do something else until the base is destroyed, this will we with any leader but don't forget to heal every 10 bases or so, so you aren't waiting around for a long repair time. Level 40 will work well but make sure you manually do it and use air where necessary. Level 20 bases gave the 2nd guy in my platoon approximately 90k xp. All event bases are very good for train SF, they have no mines and have many different layouts you can do instead of sticking with a single one that you don't like, a good way to not get bored as easily but only happens once every 3-4 weeks. I highly recommend this method, its a bit slower but you get medals while doing them. I also recommend you do the level 30 ones, not the 60s, also have an SF with 500 range and generally atleast 8 special forces members (to take our the blitz before it deals to much damage) or repairs will be more than instantly dealt with. When it comes to the blitz you will be hit, but only when hitting them, before attacking a blitz destroy the walls in front of them, then attack, the blitz will be gone and you will be left with mere seconds of repair. This is a great way of training, for a squad with any lead but does use a sacrificial vanquisher. Use a single vanquisher to remove the 2 blitz, the orbital, and the rocket silo (if you didn't get the rocket silo its fine it wont deal enough damage to make you wait on repairs), also make sure the Vanquisher is customized. 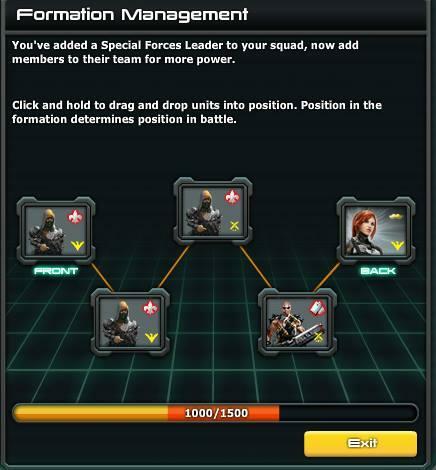 Split your squads up so the damage is not dealt to a single platoon but spread over multiple platoons. As soon as a plasma fires, or the rocket silo, take it out, it should only be able to get a maximum of 3 shots off, also take out the power plants as you walk across, this lowers the damage dealt to the platoons when you get to the opposite side. I use aggressive unless I'm hitting a plasmas or the rocket silo. The only thing that will change here compared to the 500 range leader is that it will require more vanquishers. Use 2-3 more to remove the Plasmas, once they are removed along with the 2 blitz, rocket silo, and orbital, this should literally he a walk in the park. Goodluck Commanders, hope this helps! Nice post, but I almost went blind the first time I opened it. Can you edit to eliminate the vanilla background on grey text? I dont know why it does it, I tried changing I'll take a closer look. I thought maybe I was the only one it messed up for. Also the mistakes in 4 and 5 have been fixed but yet it stays that way. When hi-lite and select the text area I can read it well. I do the Sentinel 45 bases. I have two SF platoons (lead + 4 ops) and leveled them 10+. I'll take on the Veracraft 50 bases per your suggestion. Works real well, have a friend who I've been playing with for years who uses a single LO platoon taking out what I suggested, it works well, you'll just have to deal with the vanquisher repairs. also make sure you have Custom Vanqs, accelerator armor especially. do special forces split the exp or is it a base amount for all for the base you hit. Thanks for this! I am having one point of confusion though. How do I read the "Next Rank" numbers? At first glance it looks understandable. That being (125000/600000) should mean that the unit is currently at 125000 and it needs to get to 600000 to attain the next rank. But this does not seem to be the case. Can anyone explain? Ok, Thanks Fert000. It just seemed that they were upgrading before they got to that number. I will pay closer attention next time. I upgrade them by using he Verkraft 30 bases. Also, remove the ion turrets after removing the watchtowers. YOU WILL NEVER GET ME! What makes you doubt life comes when you feel you will never doubt your life again. Anyone have ideas on tactics with what formation you put your special forces in? I'm trying two mixtures of a Marksmen with operator behind with charged ord then some heavy operators.